Tea picking at the Zealong Tea Estate. Photo: Catherine Fry. 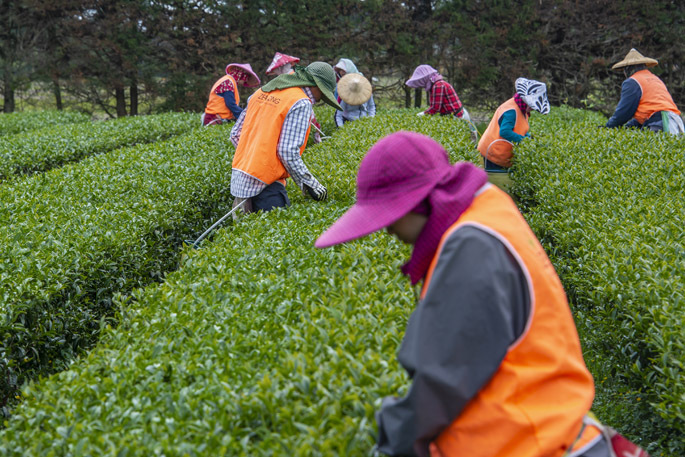 An air of anticipation and excitement sweeps over the Zealong Tea Estate, north of Hamilton, as their first harvest of the season gets underway. It’s November – old acquaintances have been renewed and newcomers have been welcomed into the team. The last harvest was March 2018. During the break from picking, the estate’s 1.2 million Camellia sinensis plants have been nurtured and prepared for harvests in the first three weeks of November, January and March. In accordance with the estate’s certified organic status, certified and approved organic products have been sourced from all over the world and applied to the 22 hectares of tea plants. The founder of Zealong Tea, Vincent Chen, famously brought 1500 cuttings in from Asia in 1996, to try growing them in New Zealand. All of the 1.2 million plants at Zealong today have been propagated from the original 130 cuttings that survived NZ quarantine more than 22 years ago. Zealong’s research and development manager Fabien Maisonneuve tells Coast & Country News of the lead up to the three yearly harvests and the methods used at the estate. “It is important to remember that the surviving plants were the strongest, most resistant ones, and their traits are reflected throughout the plants today,” says Fabien. All year, what happens to the plants is carefully monitored by the tea masters. The science behind the plant care, and smell, taste and quality of the teas produced from each harvest, is a result of every measured action throughout the year. “Our whole process from picking to packaging is organic,” says Fabien. It is the tea masters and farm manager who decide on a daily basis which blocks will be picked and when. They control how often the tea is brought up to the factory for processing, and which type of tea it will be processed into. Tea picking is an art and is done by hand, requiring highly trained workers who can deftly cut the top three leaves from a stalk, minimising damage to the plant that slows regeneration. Top pickers tape razor blades to their fingers, and work at speeds that only experience can bring. “In the past 80 per cent of our workers were from overseas, but after training programmes 80 per cent of our workers are now locals,” says Fabien. Around 20 expert processors work shifts in the factory throughout the harvests, and around 60 tea pickers are employed. Many of the overseas specialist workers are from plantations in Asia, and return there for the picking season, migrating between the countries for work. Traditionally, the November picking harvests the nutrient, rich, young leaves that are ideal for the high quality green teas, and oolong teas. January harvests, when the weather is hotter and drier, are used for stronger oolong and black teas. The March harvest produces tea suitable for oolong, and if cool enough, green tea. Picked tea is initially collected in plastic baskets that have holes for aeration and can be washed easily. “How often the tea is taken from the field to the factory is entirely dependent on which type of tea they are picking for,” says Fabien. Leaves must not start to oxidise and dry out until the factory can control the oxidation speed. Green tea remains unoxidised, while black tea is fully oxidised. Zealong’s 2015-built factory has a state-of-the-art glass house area where tea is laid out on mats to dry in a temperature and humidity controlled environment, complete with fans and ventilation. The very hands-on process is carried out by skilled processors who understand the requirements for making the finest tea. Tea is laid out on stacked withering trays for further drying. Using traditional techniques to separate clinging leaves, 100kg at a time are put through bamboo drums to oxygenate them, and then laid out on bamboo trays to oxidise. Drying and shaping is carried out using several different machines, after which the tea is now in small, dried balls. The end product is rough tea and can be fine-tuned to fit client requirements. The expert tea masters touch and smell the tea carefully, monitoring each stage and saying when the tea can move onto each stage of processing, depending on whether they want green, oolong or black tea. Some tea is blended with different herbs and spices to make the extensive range of blended teas Zealong produces. The care and expertise shown to these plants is evident at every stage of the process to produce 20 tonnes of finished tea each year, from growing to picking, drying to blending, and in the beautifully packaged and presented final product.